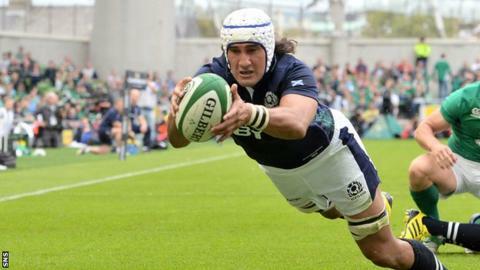 Scotland have called up loose forward Blair Cowan as an injury replacement after lock Grant Gilchrist's Rugby World Cup was ended by injury. Gilchrist, 25, was withdrawn during the first half of Scotland's 39-16 win over USA on Sunday. London Irish's Cowan, 29, born in New Zealand to a Scottish mother, was in Vern Cotter's initial training squad for the tournament. The Scots, who top Pool B, face South Africa on Saturday. Cotter's men lead the Springboks by three points with Scotland having picked up bonus-point wins from their opening two fixtures against Japan and USA. "We're all really disappointed for Grant who is an important player to the group, both an athlete and as a decent human being," Cotter told the Scottish Rugby website. "Blair, who comes in, was a bit unfortunate to miss out on selection in the initial 31-man group, but has shown great character to continue his work, stay fit and focussed, in case such an opportunity came up. "He knows our systems well having spent a lot of time with this group before and during our pre-season campaign and will fit in seamlessly, and bring his freshness, leadership and enthusiasm to our training ahead of some very tough Test matches." Cowan, who started every match in this season's Six Nations, admitted he was "devastated" to miss out on the original squad but insists he is ready to face the Springboks. "The (coaches) know what I can do," he said, "I don't need to prove myself. I just want to come up here and be positive. Even if it's just in training, I'll just bring some energy. "And if I'm called up to play on Saturday am I ready? Yeah - just show me the jersey." South Africa lost to Japan but took two bonus points by virtue of their four tries and being within six points of the winners. A bonus-point 46-6 win over Samoa followed for Heyneke Meyer's side. In the absence of Gilchrist, Cotter still has Tim Swinson and brothers Jonny and Richie Gray available as second-row options. David Denton, John Hardie, Josh Strauss, Alasdair Strokosch and Ryan Wilson are the back-row forwards already in the Scotland squad.